3. 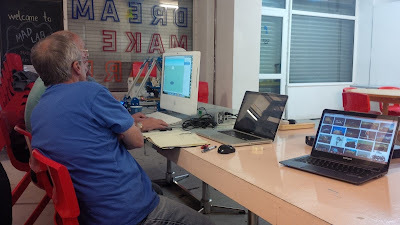 Our usual problem solving, skills building and general 3D printing japery! BCP Labs are a new 3D printing outfit headed up by founding members of #3DPM. Their printer is as good as the MakerBot replicator 2, comes with one years warranty, and is available in any colour you can see in Faberdashery. Keith the chief engineer of BCP Labs (they've got a materials scientist, electronics guru, and coder extraordinaire on board too), has re-engineered a Mendel to make prints faster, quieter and smoother. He says that this means his printing is more accurate and repeatable, and he has run his printer 24/7 without breakdown for over fifteen months. He'll swap out any broken parts for a year of purchase, and any of the plastic parts, he'll offer good will for a much longer period. We here at #3DPM were happy to let him show off, as for every printer he sells, we get £50 into #3DPM coffers. This would go some way to cover the cost of plastics and other consumables we go through, not to mention being able to give something back to MadLab for their hospitality. BCP Labs will have their website up and running as soon as possible, and they're setting up their printer to be sold as a kit as well. You can contact them by emailing: sampatankar@gmail.com until they're website is up and running! Big P.S. to all! 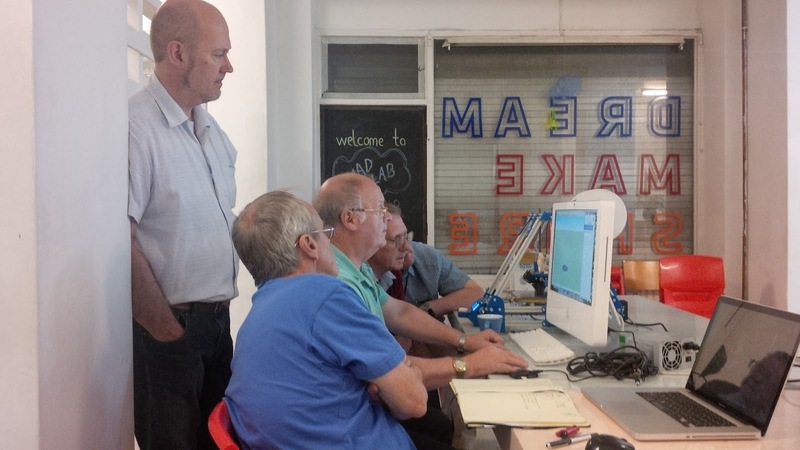 We're open to any other 3D printer makers to come along and show off their wares! Just do it! Get Involved! Our group spent some time brain-storming, what could we do? Something that would stretch our Sketch-up skills, and our 3D printing skills! What to do?! Well, it hit us like a brick wall! Theo Jansen's 'Strandbeest' was our inspiration. His work has been to take the natural physical forces mediated through organic and inorganic materials to create new 'species', that react to the world around them, powered by the wind. This we can do! We are going to create a wind-powered kinetic structure that hangs suspended between the roof-tops in Edge Street, Manchester. We've emailed Theo Jansen to see if he can give us some idea where to start, and we've emailed all the local art colleges and engineering departments to get them in on the action! Time to get this out there! Next session we'll begin work on what we want from the design, and perhaps if we've time start to think about how we'll achieve it through design and printing! Steve (another new member) came along. He designs components that make manufacturing processes more efficient, and he came along to see what 3D printing could do for him. By his own admission he was really happy, and he left with tips, tricks and software to help him achieve more of what he wanted. 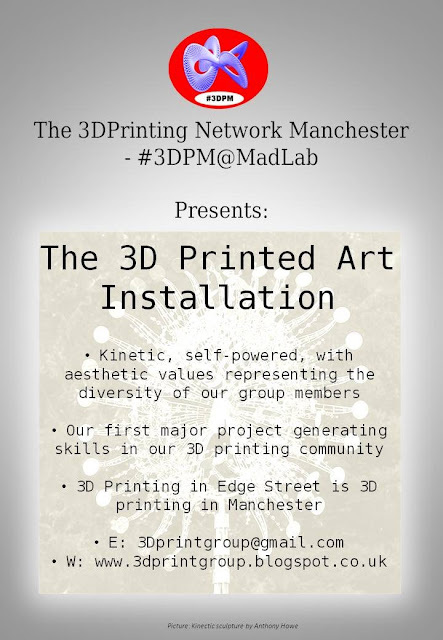 This is what the group's about, advice exchange and to support members' hobbyist and commercial ambitions!Next meet is the 9th of September, at MadLab, from 6 to 9 pm! 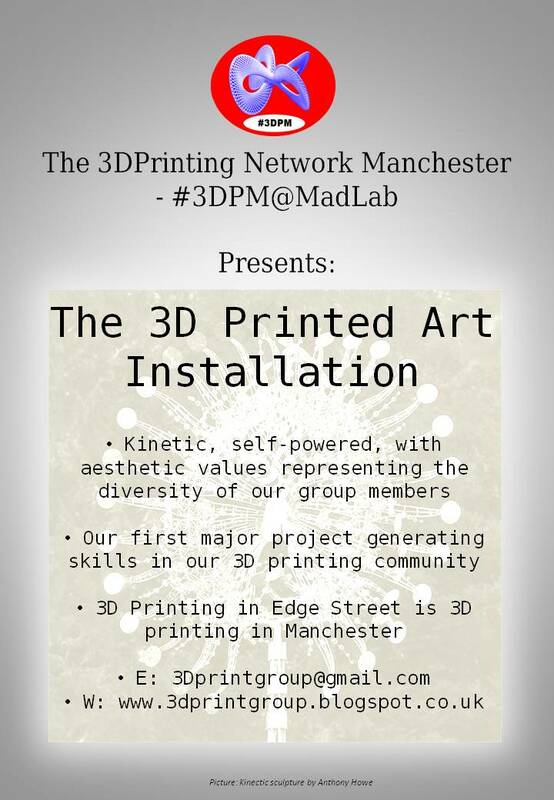 We're going to see someone else show off their wares for sale, work on the art installation, and be there for all with their 3D printing problems!